Let Open Seas guide you on your journey to Cloud based computing. As one of the world’s most recognised brands Microsoft needs little introduction. Open Seas has been a Microsoft reseller for nearly 20 years focusing on the server & workstation operating systems as well as the familiar Office suite of products. Microsoft Office is now Office 365, Microsoft’s flagship and most familiar Cloud based offering albeit with on premise options too. Let Open Seas help you determine which O365 subscription meets your needs. 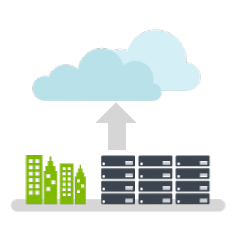 As ‘on premise’ servers reach their end of life Microsoft Azure Cloud hosted servers offer an attractive alternative especially if you have legacy applications you need to maintain. Computing is becoming a commodity purchased by subscription. Just as you plug in & pay for the electricity you’ve consumed the same is becoming true for IT. Why would you have the capital outlay & ongoing cost of owning an on-site server when you can rent one in the Cloud? Let someone else deal with the backups and patch management whilst you can access your cloud based server from in the office, at home or even when at the beach. If you need more computing power just increase your subscription, when you need less just reduce it. Azure Virtual Machines gives you the flexibility of virtualisation for a wide range of computing solutions – replacing end of life physical servers, building development and testing systems, running applications and extending your on premise data centre. It’s the freedom of open-source software configured the way you need it. It’s as if there was another rack in your data centre, giving you the power to deploy an application in minutes instead of weeks. Office 365 provides flexible and familiar tools for collaboration across teams, devices, and platforms. Whether you’re working in your office or on the go, you get a familiar, top-of-the-line set of productivity tools. Office applications —always the latest versions—let you create, edit, and share from your PC/Mac or your iOS, Android™, or Windows device with anyone in real time. You have control over your data security and compliance with privacy, transparency, and refined user controls built right in. Whether you’re working online or off, from your computer, tablet, or phone, Office 365 has you covered. This site is owned and managed by Open Seas (UK) Ltd with Microsoft Azure content recreated from Microsoft's material. Open Seas are an official Microsoft Azure reseller in the UK.